Oceans cover about 70 percent of the Earth's surface. The huge body of salt water on the Earth's surface is divided into four major oceans: the Pacific Ocean, the Atlantic Ocean, the Arctic Ocean, and the Indian Ocean. This map shows the location of all the oceans and other major water bodies. Oceans play an integral role in many of the Earth's systems. The ocean supports the life of nearly half of all species on Earth, providing 20 percent of the animal protein and five percent of the total protein in the human diet. Though there generally are considered to be four different oceans, there are no physical divisions separating them, thus the water flowing through them is the same. The five major oceans on Earth are the Pacific Ocean, the Atlantic Ocean, the Indian Ocean, the Arctic Ocean, and the Southern Ocean. The Pacific Ocean, the Earth's largest ocean, flows to the west of the Americas and along the eastern edge of Asia. 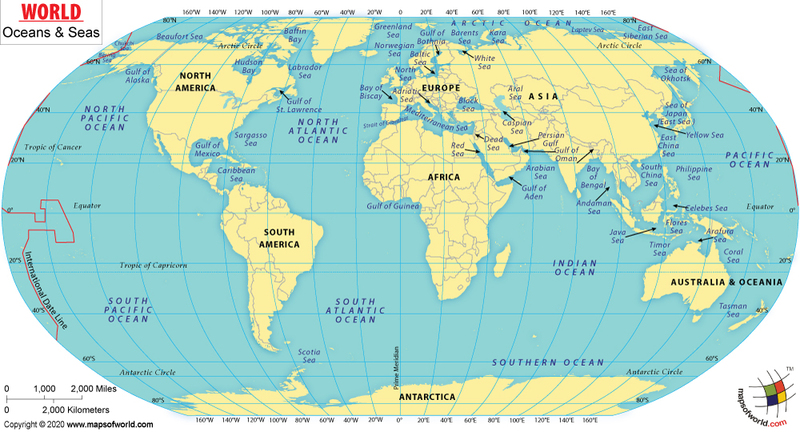 The Pacific Ocean is sometimes divided into the North Pacific and the South Pacific. 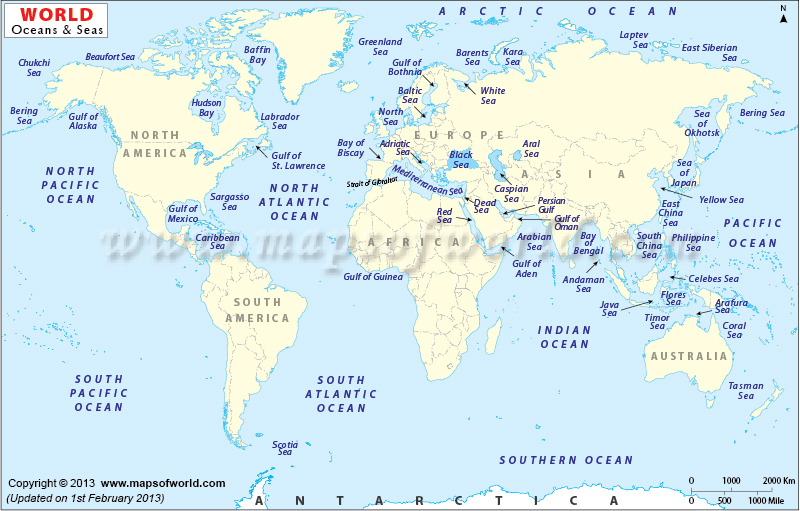 The Atlantic Ocean is between the Americas and Europe and Africa, and like the Pacific, the Atlantic is also sometimes divided into the North and South Atlantic. The Indian Ocean is situated below the Indian subcontinent, to the east of Africa and the west of Australia and the islands like Malaysia and Indonesia. The Arctic Ocean is around the north pole, and is the shallowest ocean of all - sometimes considered a sea rather than an ocean. The Arctic is encompassed primarily by North America and Russia, and its waters are partially covered by ice year-round. The International Hydrographic Organization designated the waters surrounding Antarctica to be the Southern Ocean in the year 2000, extending to the latitude of 60 degrees. The oceans of Earth serve many functions, playing an integral role in the Earth's weather and temperature. Oceans moderate the Earth's temperature by absorbing incoming solar radiation. The continuously moving ocean currents distribute the heat energy around the globe, heating the land and air during winter cooling it during summer. Tides change twice a day all over the world, as the oceans rise and fall along the shoreline. Scientists think this is caused by the pull of the sun and moon on our Earth, and the Earth's rotation. Source: Adapted from World Water Resources and Their Uses, Joint SHI/UNESCO Product, prepared by Prof. Igor A. Shiklomanov, 1999.